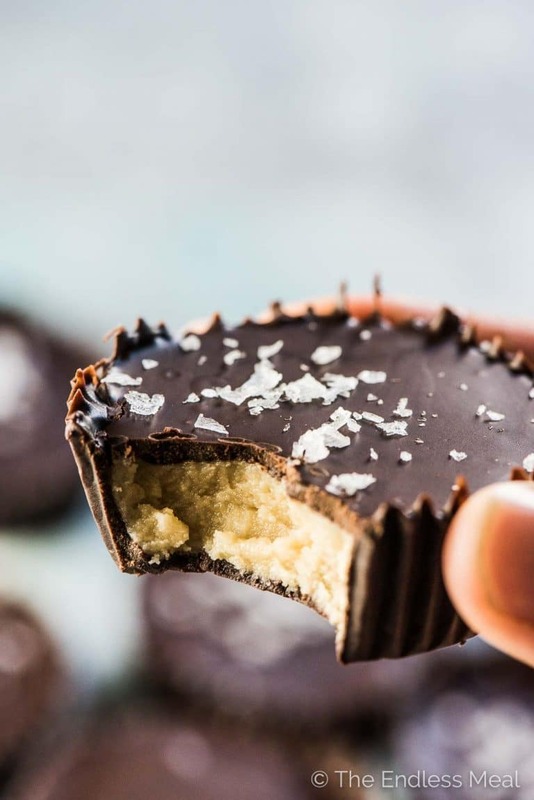 Vanilla Cashew Butter Cups for the big-time healthy dessert win! 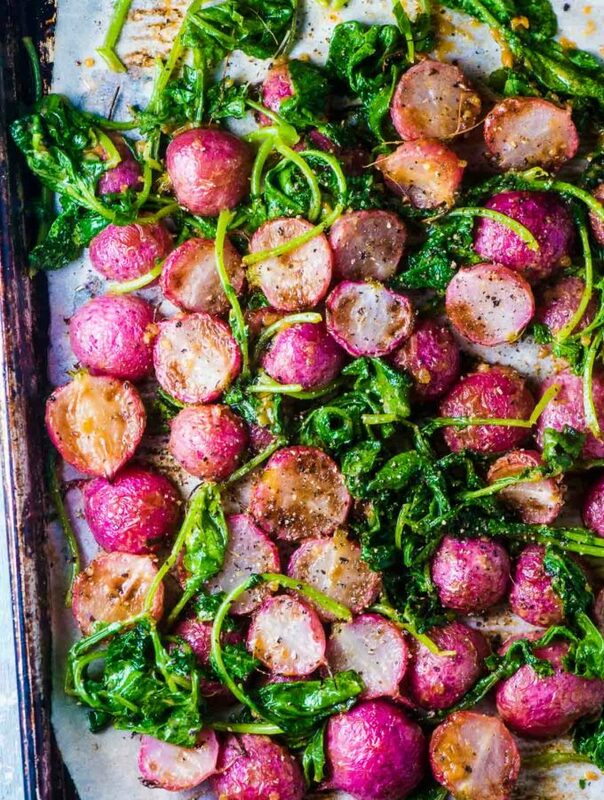 This delicious (and easy to make!) 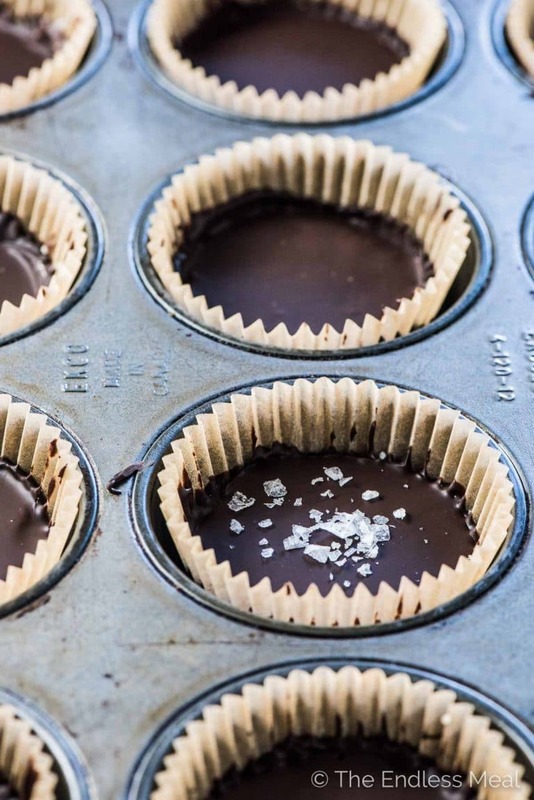 spin-off of peanut butter cups are as decadent as the original but made with only 5 ingredients and they're all good for you. 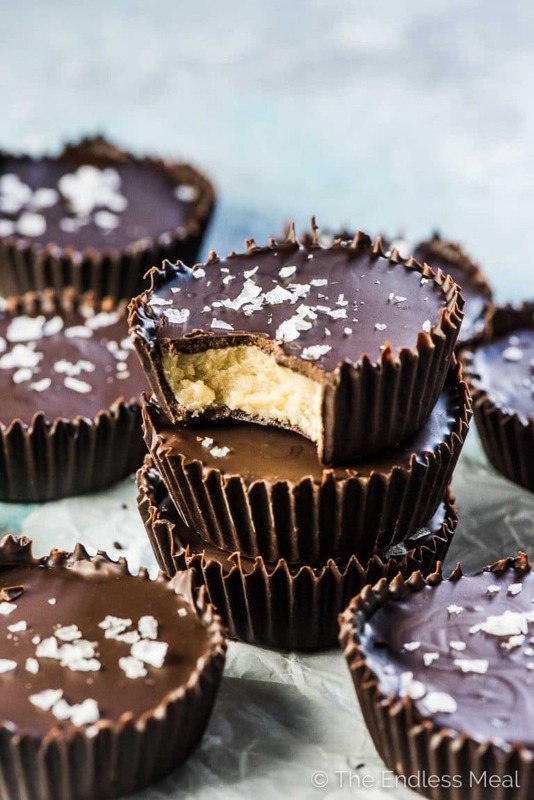 Vanilla Cashew Butter Cups. Because I love us. And I love Reese's Peanut Butter Cups. And we deserve to eat all the good things. And speaking of all the good things, those beauties are made with five nice, normal, good for our bodies ingredients. You know, like dark chocolate (antioxidants!) and cashews (healthy fats and protein!) You get to choose whether you want to make them with honey or vegan-friendly (and delicious) maple syrup. 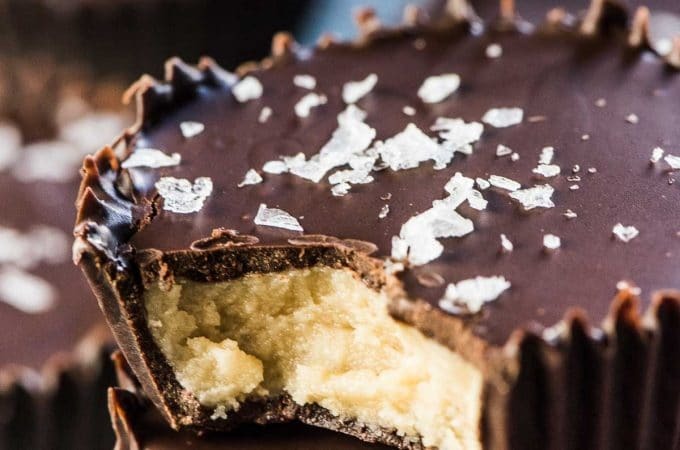 Then all you need is a splash of vanilla and a sprinkle of flaky sea salt and you're in cashew butter cup heaven. 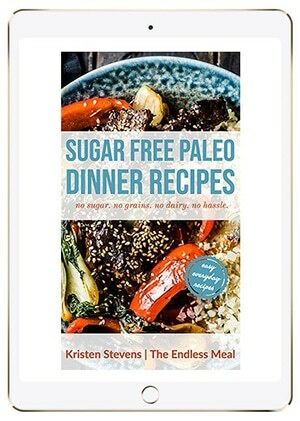 ♡ Get transported back to your peanut butter cup filled childhood and feel good about it. ♡ They're crazy easy to make. If you can melt, mix, and pour then you can make these. ♡ Dark chocolate and sea salt because there is no better combination. ♡ Creamy cashew butter that's lightly sweetened and with a hint of vanilla is EVERYTHING. ♡ Wrap everything up in easy to pick up (and super cute) chocolate cups and feel the love. But don't make them (or not make them!) because of that. Make them because they're ridiculously delicious. Then share them with your friends and watch their minds be blown. When my handsome man took his first bite of one he said to me, “Holy damn woman what is this magic?” When I told him they were vegan/ paleo cashew butter cups he looked at me like I was trying to pull a fast one on him. Healthy desserts aren't supposed to taste this good. The reason most nut butter cups recipes fail is that they don't give directions for properly melting the chocolate. The majority of the recipes call for melting the chocolate with coconut oil, which makes it pourable but it will never fully harden at room temperature. Unless we're talking about ice cream, I don't want to have to keep my healthy desserts cold in order to keep them from melting all over the counter! Tempering chocolate is just a fancy way of saying melting chocolate. But you do have to know how to do it properly. Let the chocolate get too hot will get you thick, spreadable chocolate. Melt your chocolate properly and you'll get silky, glossy, pourable chocolate. Tempering chocolate (without a thermometer) is easy, but you need to know a couple of tricks. 1. Always start with the best chocolate you can. Quality chocolate (I'm looking at you Callebaut, Valrhona, and Jacques Torres) contain a lot of cocoa butter. More cocoa butter = better melting chocolate. But, they are expensive. I have used inexpensive chocolate (that's you, Kirkland Signature chocolate chips) but the results are not consistent. Sometimes it melts nicely, often it doesn't. 2. Melt the chocolate over very low heat. If you have one, you can use a microwave. Technically, you should take the chocolate off the heat once it reaches 115 degrees Fahrenheit. What you're really going to do is take the chocolate off the heat when most of it has melted. Let's keep this simple. 3. Then you'll add a little extra chocolate to the pan and stir it around while the residual heat melts it. That's it. Now you can pour that chocolate into your little cups and when it hardens you can store your cashew butter cups on the counter. Where they should be, thank you very much. Use it as is and call it rustic. You won't get the smooth top to your cashew butter cups like you see in the pics here. But honestly, who really cares? It will taste EXACTLY the same. Add some coconut oil. 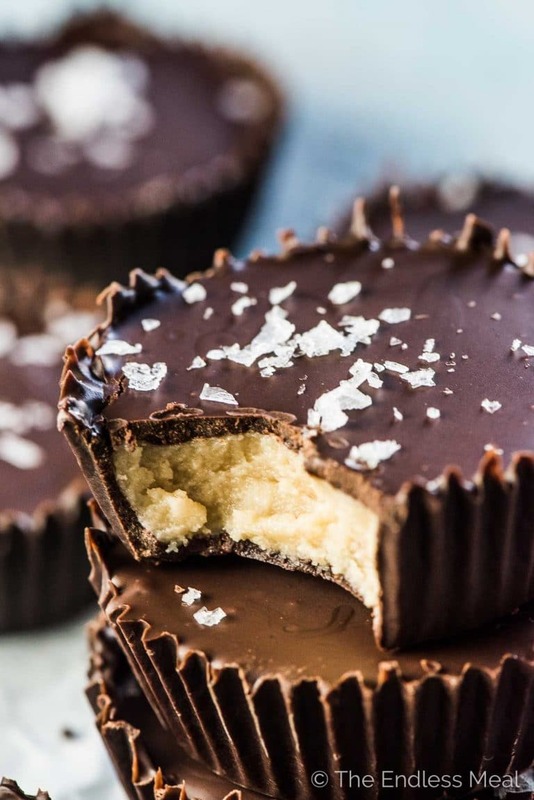 A spoonful of coconut oil will loosen your thick chocolate so you can pour it into the cups for maximum prettiness. Just remember that if you add coconut oil to the recipe you will have to keep these in the fridge. Now my friends, go and devour these cashew butter cups. You deserve it! If you love these Vanilla Cashew Butter Cups as much as I do, make sure to give them a 5-star review in the comments below! 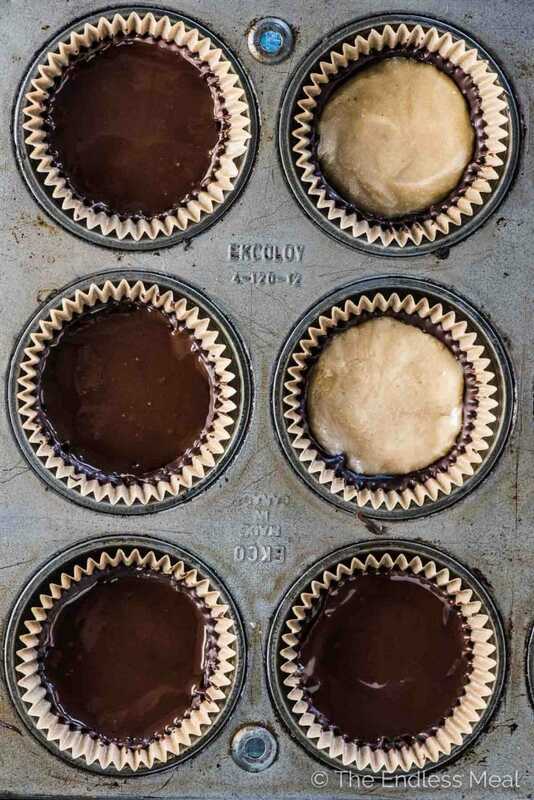 Line a 12 cup muffin tin or a 24 cup mini muffin tin with liners. Place 2/3rds of the chocolate in a pan over low heat. Once it is glossy and looks mostly melted remove it from the heat and add the remaining chocolate. Stir a few times while the residual heat melts the chocolate you just added. Working one at a time, add slightly less than a tablespoon of the melted chocolate to one of the cupcake liners. Tip it on its side and rotate it so that the chocolate comes 1/3 of the way up the side of the liner. Repeat until all the liners have a chocolate coating then place them in your fridge to harden. Add the cashew butter, honey, vanilla, and salt to a medium-sized bowl and gently fold them together. Once the chocolate cups have hardened, divide the cashew butter between the cups. Use your finger to press it down into the cups. Pour the remaining chocolate over the tops of the cashew butter cups then pop them back into your fridge to harden. 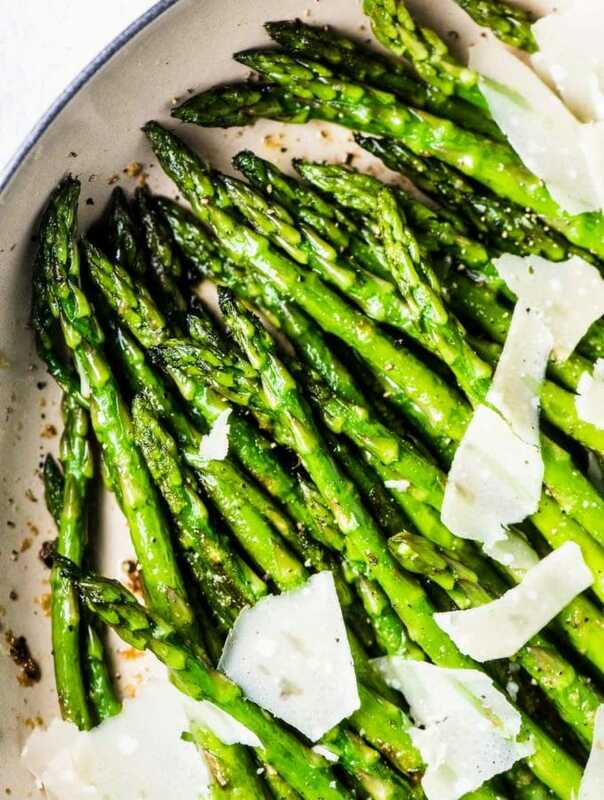 Make sure to sprinkle a little flaky sea salt on top to make them totally irresistible! If you follow a paleo or vegan diet, make sure to read the label on the chocolate to make sure it's ok for you to eat. If you have a microwave you can use it to melt the chocolate. 20-30 seconds should do the trick. Cashew butter can be pricey. You can make your own with a food processor or high powered blender and about 10 minutes of your time. You'll need 2 cups of raw cashews plus 1 tablespoon of coconut oil to make 1 cup of cashew butter. I bought almond butter instead and I’m not too pleased with the taste. It taste too creamy and I think I used too much butter. First of all, these were delicious. I ate the last of them today and was sad when they were gone. So, to those smart people who read the comments before trying an internet recipe: buy extra chocolate. If you don’t need it, you’ll still have extra chocolate, and that’s always a win. I’m so happy you liked them! I’ve made them a few times as the recipe is written but think I should make them again to test the chocolate ratio. It’ll be a good excuse to eat more of my fav dessert! Hi, just wondering if you know how long these keep at room temperature before going rancid? These are amazing! No one would guess that they’re healthy. Everyone was asking for the recipe so you know it was a hit! Healthy treats are so good, aren’t they? These are the best things ever! The first batch I made dissapeared so fast that I made another one right away lol. It won’t be the last! Hahah that’s so awesome! I’m happy to hear they were a hit!! I love your recipe.the taste of vanilla and cashew nuts just awesome. Great recipe! I totally agree that chocolate is one of the most important parts of any candy replica–you NEED to find a proper heating method for it! Definitely want to give this a try. Cashew butter is such a delicious nut butter, and with chocolate and chunky sea salt flakes = brilliant! It one of my fav nut butters. I love the way it’s naturally sweet! Love your recipes! To make peanut butter cups would I just use peanut butter instead of cashew? Yep! Peanut butter would work just as well!